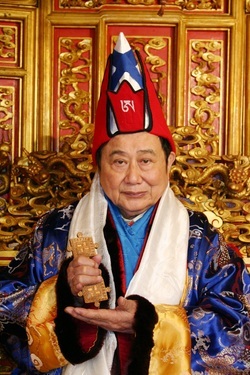 His Holiness Grandmaster Professor Lin Yun was the founder and supreme leader of contemporary Black Sect Esoteric Buddhism at its Fourth Stage. His Holiness was not only revered as a religious leader, a scholar, but also the world’s most prominent authority on Feng Shui. He named his Feng Shui theories Black Sect Esoteric Buddhism Feng Shui. Highly regarded as the founding father of Feng Shui in the West, he has developed and transmitted the teachings of the Black Sect Esoteric Buddhism Feng Shui to the West since the early 1970s. It is due to H.H. Grandmaster Lin Yun’s efforts, the ancient wisdom of Feng Shui became known and popular to Westerners. His Holiness Grandmaster Lin Yun was a native of Taichung, Taiwan. His parents were both descendants of the well-respected Lin Family of Taichung in Taiwan. During the Sino-Japanese War, his parents moved the family to Beijing. His Holiness Grandmaster Lin Yun was born and raised in Beijing, and began studying Black Sect Esoteric Buddhism with his first master, Lama Da-De at Yong-He Palace when he was six years old. At the age of seventeen, His Holiness Lin Yun left Beijing and returned to Taiwan, where he studied with two great masters of Black Sect Esoteric Buddhism, Master Hui Chieh-fu and Master Cheng Kwei-ying. His other teachers were distinguished philosophers, artists, and scholars, such as Professor Cheng Ti-hsuan. He also held a B.A. in Law from National Taiwan University and a B.A. in Urban Planning Administration from Cultural University. After years of studying and practicing meditation, His Holiness Grandmaster Lin Yun developed extraordinary abilities and attained a high level of spiritual enlightenment. With his power, wisdom and compassion, he devoted his entire life to help people by resolving challenges in their daily lives via Ch’i adjustments, Feng Shui consultations, sacred transcendental cures, meditations, alternative healing methods, and bestowing his blessings upon those in need. His Holiness Grandmaster Lin Yun was also well-known for his unique, valuable and comprehensive teachings. Through the integration of Buddhist teachings, Yin-Yang philosophy, the theory of Ch'i, Feng Shui, spirituality, holistic healing, transcendental cures, and Chinese folklore, His Holiness Lin Yun developed his own unique and efficacious teachings, also known as Black Sect Esoteric Buddhist teachings. Furthermore, through the use of contemporary knowledge to interpret ancient Chinese wisdom, His Holiness was able to make his teachings much more receptive, adaptable and applicable to the modern world. He revived and reinvigorated the ancient Chinese wisdom of Feng Shui and folkloric culture and transmitted his teachings to the West. His Holiness Lin Yun’s teachings not only help people to resolve the difficulties and challenges in their daily lives, but also enhance people's well-being, elevate their spiritual level, and transform their lives. Due to the clarity, comprehensibility and efficacy of His Holiness Grandmaster Lin Yun’s teachings, these are now being widely practiced both in the East and the West. The recent surge of interest in Black Sect Esoteric Buddhism Feng Shui in the West can be undoubtedly attributed to the influence of His Holiness Grandmaster Lin Yun. In 1997, His Holiness Grandmaster was awarded an honorary degree in Humane Psychology by the Northern California Graduate University, in recognition of his achievements in the bridging of Eastern and Western cultures and to affirm his spiritual and mundane mentoring of numerous people. In 1998, His Holiness Grandmaster Lin Yun was enthroned by His Holiness Lungtok Tenpai Nyima, the supreme leader of the Tibetan Bon tradition and the 33rd Abbot of the Bonpo Menri Monastery. The enthronement signified the recognition of the deep connection between H.H. Grandmaster Lin Yun, the Fourth Stage Black Sect Esoteric Buddhism and the Tibetan Bon tradition. As a distinguished religious leader and the foremost leading authority on Feng Shui, His Holiness Grandmaster Lin Yun received numerous invitations from leading academic institutions and religious communities all over the world. He gave talks at prestigious venues, such as the Library of Congress, the Parapsychology Society of the United Nations, the Women's Guild of the United Nations, the Society of Enlightenment and Transformation of the United Nations, and the American Institute of Architects. He lectured at Harvard, Yale, Princeton, MIT, Stanford, UC Berkeley, UCLA, Cornell, Duke, Johns Hopkins, University of Hawaii, University of Minnesota, California Institute of Technology, University of Pennsylvania, Wellesley College, Brandeis University, Dartmouth College, Williams College, University of Washington, New York Institute of Technology, Oxford University in England, University of Duisburg, Heine University, University of Munich in Germany, Beijing University, Qinhua University, and the Chinese Academy of Social Sciences in China, etc. His Holiness Lin Yun also conducted numerous lectures and workshops around the world, including the United States, Great Britain, France, Spain, Germany, Norway, Austria, Switzerland, Italy, Hong Kong, Taiwan, China, Singapore, Malaysia, Thailand, Indonesia, Japan, India, Australia, Brazil, Mexico, Nigeria, and South Africa. His Holiness Lin Yun was also frequently interviewed by the news media, including national and local television networks, such as CBS, NBC, ABC, PBS, FOX, the BBC of England, and major television networks in Taiwan, Hong Kong and Far East Asia. Interviews and articles on H.H. Grandmaster Lin Yun and his teachings often appear in newspapers, journals, and magazines throughout the Americas, Europe and Asia. His Holiness Lin Yun acted as a trusted advisor and confidante for many political and business leaders around the world. He was a much sought after spiritual leader giving guidance and resolving difficulties and sufferings in many people’s lives. His Holiness Professor Lin Yun was an Adjunct Professor of the School of Arts and Letters at San Diego State University since 1997. Previously, he was Lecturer at the Yale-in-China Program at Hong Kong Chinese University, Visiting Professor at University of San Francisco (1980-81), Visiting Professor at Stanford University (1981-82), and Research Professor at the Institute of Far Eastern Studies at Seton Hall University (1982-85). In 1986, His Holiness Grandmaster Lin Yun founded the Yun Lin Temple in Berkeley, California, the first reformist Black Sect Esoteric Buddhist temple at its fourth stage in the West. In 1994, he established the Yun Lin Temple Cultural Center in Berkeley, California. In 1996, H.H. Grandmaster Lin Yun established the second official temple, Lin Yun Monastery, in Long Island, New York. In 2008, the Taipei Temple was inaugurated in Neihu, Taipei, Taiwan. Since the early 1980’s, numerous sanctuary shrines known as “Yun Shi Jing She” were also set up in different parts of the world. In 2002, His Holiness Grandmaster Lin Yun appointed Khadro Crystal Chu Rinpoche as his successor. In 2007, he announced the appointment in public that H.H. Khadro Crystal will carry on the lineage of Black Sect Esoteric Buddhism and transmit Black Sect Esoteric Buddhist teachings. On August 11, 2010, His Holiness Grandmaster Lin Yun left the world in the San Francisco Bay Area at the age of seventy nine. His friends, disciples, students and godchildren around the world were overwhelmed with grief and mourning. Copyright © 2011-2019 Yun Lin Temple. All Rights Reserved.